Well folks, at the moment the ice is coming along nicely and the small, but dedicated crowd of ice fisherman who have chosen to brave the cold temperatures are being rewarded for their efforts. Even though our snow cover has slowed down the ice forming a bit, it's been well below zero every night this week and it's still making ice pretty fast. Rough estimates of ice thickness ranges anywhere from 7 inches to 10 inches. One of my pals is working up on Winnie right now and he reported seeing one truck parked outside an ice shelter on Bowens Flat and another truck driving out from the Third River Landing. ATV's and snowmobiles are traveling freely everywhere (the ones that are out there), but there aren't really a lot of folks picking up on the news so far. 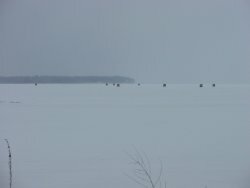 Another friend called this weekend from Lake Vermillion where they had just set up an ice shelter and were also reporting about 7 inches of ice. The Walleyes were biting over there and he and his fishing partner already had 7 fish in the bucket when he called at around 11:00 AM. I've been dragging my feet about getting out on the lake because of my addiction to Deer hunting. Sunday was the end of our muzzleloader season and I finished off the season at 4:30 by adding one last notch to the "smoke pole" by filling one of my doe tags. Now I'm officially out of excuses so I'm gathering up the fishing rods, dragging out the Otter and the Lazer for my first trip out to the lake. While the early reports start to come in and we work up a head of steam, I've decided I kind of like hearing from some of you that are out there on the lake, so if you want to add your 2 cents worth click here to drop us a line. Maybe I'll start working more of these fishing reports and pictures into my weekly updates. There are a few houses out on Bowen's Flat, Lake Winnie. Fish are fairly cooperative, but the word is just starting to trickle out and the crowd is still small. These days, the weather might still be throwing a few curve balls our way, but we're being rewarded for our struggle with some quality fall fishing. This week, the turnover occurred on several area lakes and forced me to do some "moving around" to compensate. While the fishing action has been far from wide open, we have had what I'd call steady action on most days. Some days are better than others, but we are catching our fish. Water temperatures are now stabilized again, this time they've settled in at about 51 to 52 degrees and the fish have "scattered" but they continue to feed fairly well. We've located and caught some fish in the shallows, especially where good "green" weeds still exist or on rocks when there's a breeze. We've also found a good number of fish moving deeper on to the lakes secondary drop off areas in 20 to 30 feet of water. We spent some time looking for larger fish on Cutfoot Sioux last Saturday and I was surprised by the apparently good schools of 14 to 16 inch fish located in the 20 to 26 foot range. My expectation was that we'd find some larger fish down deep, but it turned out to be the opposite. 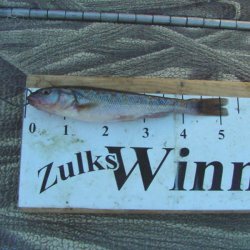 More slot fish, especially 18 to 21 inch fish are located shallow and more "keepers" 14 to 17 inch fish are deeper, at least for the moment. 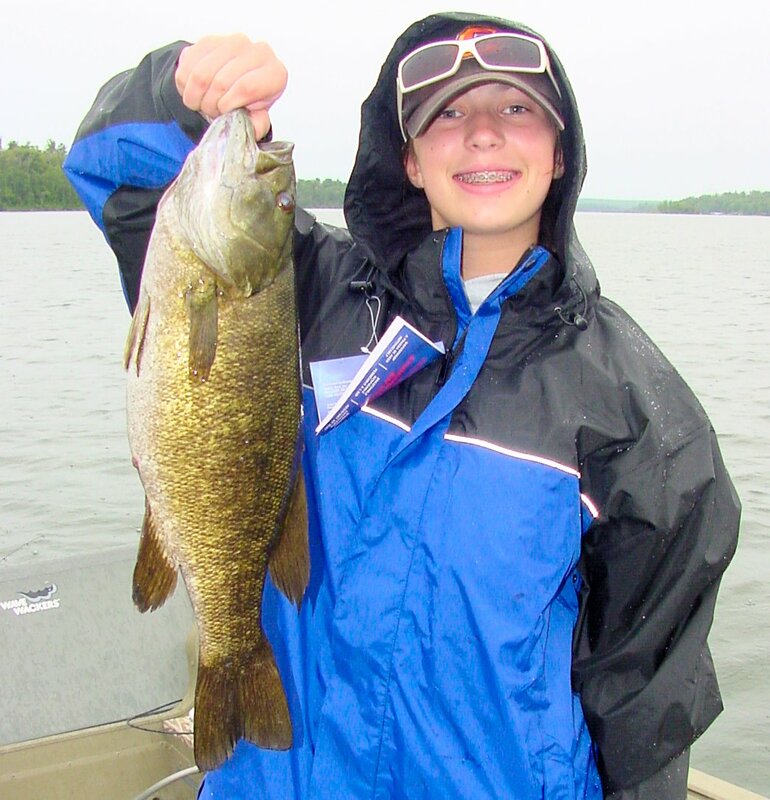 On Tuesday we wound up on the Rainy River mainly because the rain was predicted to be lighter there than at home, lucky for us we had taken that decision because we found above average Smallmouth Bass and Walleye fishing near Pelland and we enjoyed half a day without any rain falling. Fish location was not quite what we had anticipated as higher water and current levels forced the fish into more "classic river locations" in shallow water along the numerous current breaks. The deeper holes had a few fish in them, but 8 to 10 foot flats with an adjacent current break like a point or protruding rock pile were the clear ticket for the best action. Typical fall presentations have applied on both the river and lakes. Jig and minnow still accounts for the lions share of what we're catching, but we've had some really good experiences on the lakes using live bait rigs with 6 to 8 inch minnows. Creek Chub, Redtails, Suckers...they all work. The real key seems to be size more than type of minnow. On the river, we actually had better action (including the Walleye) using a 1/4 ounce jig head tipped with plastic baits instead of minnows. The better performers were 4 inch Berkley Power Bait Twisters in White or Chartreuse, Walleye Assassin 4 inch tails in Clear/Chartreuse Glitter and the 4 inch Jiggin' Shad in Black/Pearl. Wednesday we had a go with the Crappies and found them down in 35 feet of water. The bite was sluggish, but the fish were catchable and most of them running decent size 11 to 12 inches. There are lots of small Crappies around the area this year, so I've worried about fishing the deep bite because of injuring them as we bring them up from the depths. A friend, Jim Hernesman from Ray's marine told me about a little trick he uses to make it possible to release those smaller fish from deep water. Hold the fish flat in your hand like you would support a pancake, drop or gently throw the fish on to the floor of your boat making sure that the fish lands on it's side. Don't smash or slam it, use just enough force so that the fish lands firmly. The force of the "hard landing" releases the air from the bladder and the fish swims away eagerly when released. After 25 years of guiding full time, I never heard of this until last week, but it seems to work and so I plan to try it again. Today, it's raining cats and dogs at the moment and because of that, I doubt that I'll be fishing. I do have another trip planned for Friday and after that we'll be spending some time hunting. For all of you real die-hards, I'll do my best to keep a little update going for the next few weeks, but from here on out, things are winding down fast until first ice. If you're still on the water and want to contribute, please click here to drop us a line. 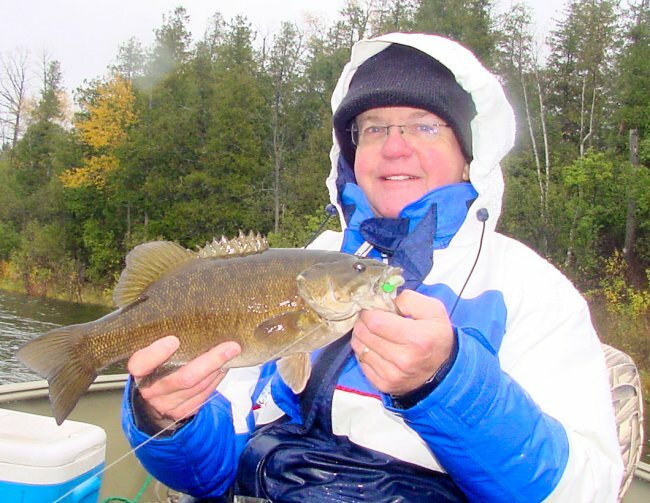 Smallmouth action helps make up for sitting out in 40 degrees with rain showers. 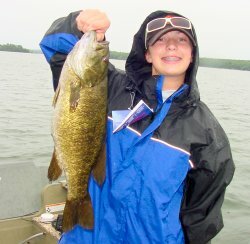 Smallmouth Bass are always fun, but add the aggressive nature of river Smallmouth and higher than normal river water levels and the strength of these fish is amplified even more. This good old boy decided to keep watch over us for a while on our trip to the Rainy River. Obviously not in the mood to fly during the rain either, we watched each other as we passed by on several drifts down the river. Dare I say it? The T-word. I've been sitting on the edge of my seat the past few days watching the surface water temperatures slipping toward 55 degrees and dreading the inevitable turnover. One sure sign that the turnover is approaching, is a period of Walleye activity that's almost too good to be true. Well we've already had that and folks that braved the windy, rainy weather earlier this week were rewarded with great Walleye action in terms of both numbers and size. Walleye activity was good during the daytime and the fish hit aggressively making them fairly easy to hook and land. The whole thing shifted into low gear on Thursday when the surface water temperatures fell into the low 50 degree range. Fish that previously pounded the jig, began picking, nibbling and dropping the bait like a pre-schooler trying his first asparagus. As bad as that sounds, we still caught some fish, but to be sure, there was a noticeable difference in the activity and location of the fish. We began "scrounging" around on a variety of spots and picked up a couple here, a couple there and so on. It's a bit early to be certain, but judging by the sudden change in activity and the shift toward deeper water, I'd say it's fairly safe to assume that we've hit the turnover. The good news is that even now, we are already in the recovery period. 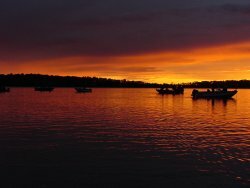 Soon fishing will stabilize and we'll get rewarded for our trouble with those last few nice evenings, pretty sunsets and late season big Walleye episodes. One key for fishing the "post turnover period" is to prepare yourself to include fishing the prime times in your game plan. Most days there will be a spurt of action just before sunset that lasts until dark. So from here on out, I'll be planning to fish right up until dark. Another key will be to focus on deeper locations that include rocky points, sunken bars and steeper drop off areas. The weedline can still be important, but finding green healthy weeds is mandatory. You'll notice that lots of baitfish that spent the summer over the weed tops on shallow flats, have moved out into open water away from the edges where dying weeds become temporarily inhabitable. We noticed that the colder water temperatures also drove the Crappies a couple of feet deeper and we found most of these fish in the deepest "holes" available. Although we faired a bit better with Crappies in terms of action on Thursday, we noticed a decline in the average size of the fish. 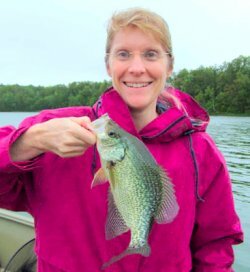 The smaller fish seemed less affected by the colder water temperatures, but larger Crappie in the 11 to 13 inch range were fairly scarce. The Crappies are mainly still spread out horizontally, but there were more of the "pods" of fish that are usually common during the fall. Whenever we found the larger groups of fish, we had more consistent action. 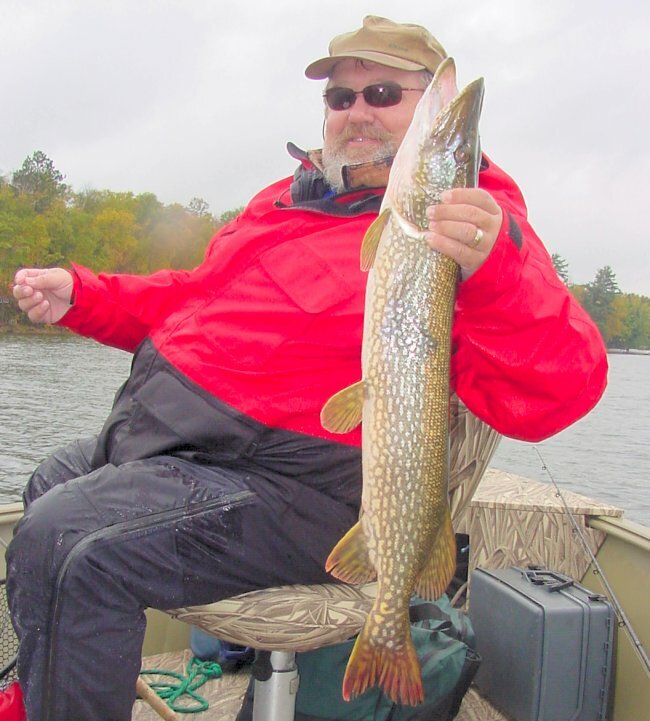 Above average Pike will be showing up more each day as the baitfish continue to stack up on steeper breaklines, rocky points and what's left of the green weed patches. Live bait rigs with 4 to 6 inch Creek Chubs, Suckers or Red Tails are a good combination to catch both Walleye and Pike on the same spots. It's getting to be that time of year when fishing the "sunset bite" pays off. After a week of rainy, cold and windy weather, it sounds like we've got a week of milder temperatures coming. We'll be planning to fish the evening bite every day from here until the end of the season. 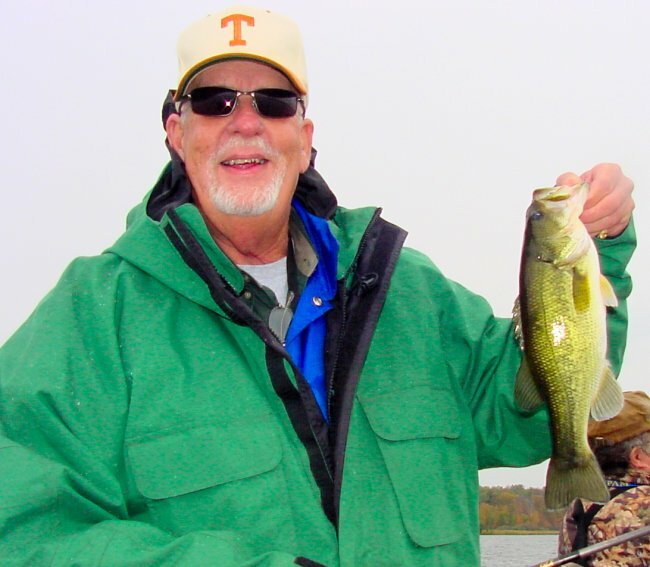 Rainy, but warm fall weather has made fishing fairly easy this week. 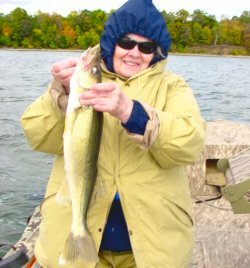 We've had some wind, but as luck would have it, there's been plenty of Walleye action on the smaller lakes and we've been able to avoid big waves by staying off the the "big lakes". During the later part of this week our water temperatures have actually risen a degree or two. Hovering now around 59 degrees, the fall bite should continue for the next several days at least. Walleye action tends to peak at these high 50 degree temperatures, but the other shoe drops when the surface temps fall below 54 or thereabouts. After that, we experience a temporary slow down, so I'd suggest giving it one last shot if you can make it out this week. Walleye location continues to center around the shallower water now whether it's the 6 to 8 foot weedlines on Lake Winnie or 20 to 22 foot weedlines of Pokegama, the principal is the same. Baitfish that lived happily in the shallow weeds all summer long begin pushing out toward the deeper weed edges. Hungry Walleyes (and other fish) find the points and pockets in the weed edge and feed heavily before the winter sets in. 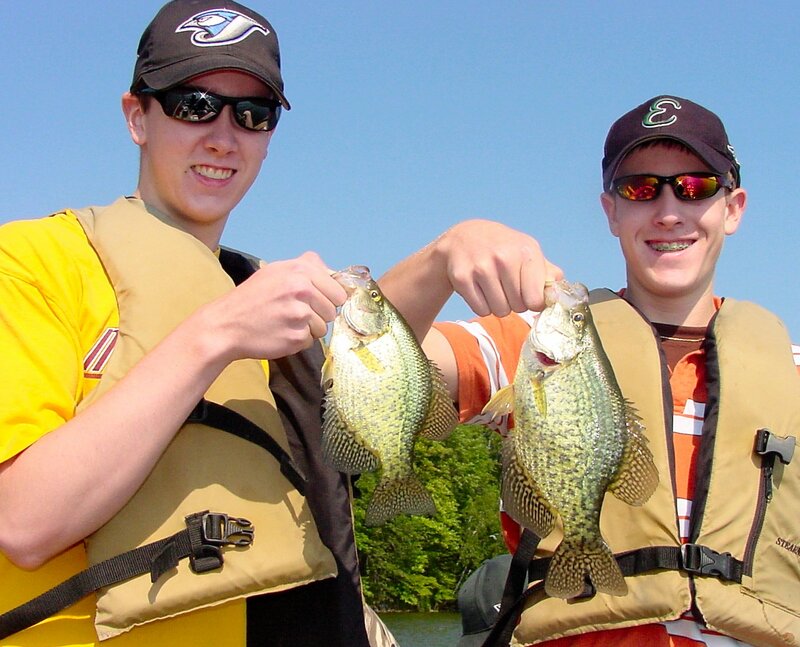 Crappies action regained some momentum this week, but we've been seeing lots of smaller than average fish. 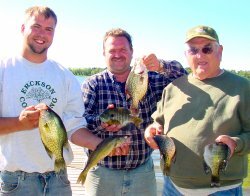 There must have been a massive hatch a few seasons back because several area lakes have large populations of 5 to 8 inch Crappies right now. If we stick to it, we are managing to get enough keepers (9 to 11 inch) to satisfy folks, so it's worth doing, but I'd say the best approach if to fish with Waxies or cut worms to bolster the odds of catching Bluegills which have been mixed in with the deeper Crappies and have often been better size fish than the Crappies. Largemouth Bass fishing continues to be good, I just wish I had the opportunity to do more of it right now. There are still enough green weeds to hold the fish and they are on their fall feeding plan too so we're catching them by accident every time we toss a jig into the better weed beds. They're location appears to be dependant only on having good, green cover with deeper water nearby, so the inside corners, steeper drop-off areas and points are all gathering places. When you find one, you'll find more right now, so if you catch one, stop the boat and continue to work the area. We've had some above average Pike action this week as well, but we've had to root 'em out of the weedlines to catch them. Casting or trolling has been okay at times, but smaller fish tend to be the ones hitting the faster moving baits. For larger fish, try a jig with a larger than normal minnow. I'd say about 6 inches is perfect and we're rigging a 17 pound fluorocarbon leader. Tie leader directly to the jig, tie a loop on the end of the leader and attach it to your line using a snap swivel. This is really simple, but effective and it protects against 90 percent of your bite off's. We've had some above average Pike action this week as well, but we've had to root 'em out of the weedlines to catch them. It's never too late to learn a new trick. Here's Don Landers with his first fish. An avid hunter, Don decided it was time to take a jig and minnow for a test drive. Here's one of the early successes from his first outing. We've had every kind of weather nature can throw at us this week. It's been cold, hot, calm, windy, stormy and gorgeous all during the same week. It's incredible to me that the fish are even trying to bite, but evidently in the fall, the urge to feed before winter sets in is more important than weather conditions. The really good news is that surface water temperatures have stabilized, in some cases even risen from 59 degrees to about 61 degrees depending on where you check them. The most noticeable signs of the colder water have been the huge schools of bait fish now found out in the outer edges of deep weedlines and even in the deeper adjacent open water areas. There have been some days that were brutal to fish, but we've been able to consistently bag at least some Walleye every day. Limits of fish? Not necessarily, because I've been fishing mostly on "slot limit" lakes where we've been releasing roughly 50 percent of our catch. But we have been able to bring in a dozen or so "keepers" on most trips this week. Walleye seemed to have switched their feeding preference to minnows, but night crawlers and Leeches (if you have them) are still producing fish. 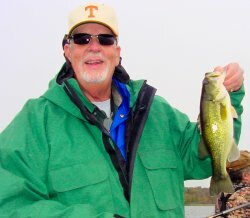 My rule of thumb is to fish jig and minnow on sunnier, breezy days and use night crawlers on the calmer, more overcast days. Walleye location has shifted a bit toward the shallower water now and I've spent more time in the 6 to 10 foot range than I did last week. Weeds are not as important as they had been because there are huge schools of baitfish on the outer edges of bars and points adjacent to deeper water. If you cover enough water, you will find some fish. One really fun experience we've had this week was Largemouth Bass fishing. Typically we catch fish using spinnerbaits this time of year but for now, the Bass are using fairly heavy cover so when we find them, we have to "root them out" using either the Texas rigged plastic worms or jumping over the heavy cover with surface baits like a slop frog. There are still enough green weeds to hold the fish and they are on their fall feeding plan too. They're location appears to be dependant only on having good, green cover with deeper water nearby. It's a great break when you get tired of fighting the wind and rain. The weather has been breezy and rainy, but the fish are cooperative as fall feeding becomes more important. Jig and minnow fishing has become more consistent this week, but fish continue to be caught on night crawlers and even leeches. The cold weather of the past week gave way to warm, humid and unstable air. So I've switched from mittens and a mad bomber hat back to the summer lightweight rain suit. Even though the air temperature has risen, surface water temperatures are hanging in at 57 to 59 degrees depending on where you check them. The most noticeable signs of the colder water have been the huge schools of bait fish now found out in the outer edges of deep weedlines and even in the deeper adjacent open water areas. While there are some encouraging signs of a "Fall Walleye Movement" starting up, it's not universal and some places are definitely better than others. After I reported last week that the Walleye seemed to have switched their feeding preference to minnows, we had a reversal this past Monday where we started out catching fish early on jigs & minnows, only to discover that by day's end, night crawlers were again the preferred food. At the time, I attributed that to the typical fall cycle where calmer, grey days seem to call for abandoning the jig/minnow in favor of the live bait rigs. My guess is that once the gloomy skies break up and we get a breeze, jig and minnow fishing will be the rule of thumb again. A note about the minnows, We've been carrying some shiners and they're working, but not nearly as well as the larger (4 to 6 inch) creek chubs. Even the Perch are taking these larger minnows over the smaller shiners. If you want to give the larger minnows a spin, you can use them on a jig, but be prepared to feed line allowing the fish some time to get the bait fully into their mouth before setting the hook. Walleye location has been varied, some fish are hanging out in deeper water now. We've seen lots of them in 18 to 26 feet, but the deeper they go, the less aggressive they've been. I had some success this week watching these deep fish during the day and then returning to the shallower adjacent structures toward evening. When the fish moved up higher on the structures (12 to 14 feet), the bite was on. I guess that with the cooler water temperatures, we'll see more movement toward the better evening bites. Usually, that doesn't start this early, but it looks like it will be driven more by the water temperature than by the time of year. Crappies had been wide open for the past few weeks, but the action slowed a bit this week. It's easy to find the fish, they're out in the open water now and we can easily get on top of a school of fish, but they've just gotten a lot more finicky. We haven't tried the "evening bite", but it wouldn't surprise me to discover that they too are starting to show a preference for that "evening run" like the Walleye. Perch fishing has been frustrating this fall with scattered small groups of fish showing up randomly. The ones we are catching appear to located mainly in heavier weed cover and are apparently well fed because they are extremely picky and hard to hook. Hopefully, I'll have some better news on the Perch as this week allows me more time to look for them. Northern Pike have been located in deep water. 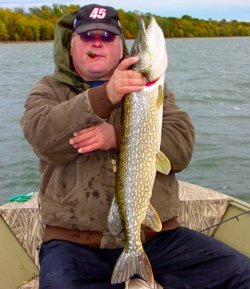 Our best Pike action has been found in water 30 feet or deeper and our presentation has been large minnows fished with live bait rigs. You can add a spinner blade to the rig if you want to, but a simple 4 to 6 foot Snell tied on heavy mono or fluorocarbon line, a 4/0 hook and a 3/4 ounce egg sinker will do the trick. We have discovered that no minnow is too large. In fact the better Pike are completely ignoring smaller minnows. Don't be afraid of 10 to 12 inch Suckers, even bigger if you can find them. The fall color has finally found us. We're looking at 5 to 10 days for the peak of color. Don't be afraid of larger minnows for Walleye right now. These 4 to 6 inch creek chubs are working well this week. They can be fished on a live bait rig or jig head but you'll need to feed line to allow the fish time to full inhale the bait. Don't be surprised when you catch perch on these larger minnows as well. Our first major cold snap of the fall has arrived with a vengeance! Tuesday was windy and cold with daytime temps barely making it over the 50 degree mark. We watched the surface water temperatures drop from 64 to about 63 degrees by days end and I suspect that it will have dropped some more by the time we make it to the lake on Wednesday morning. A lot of what we did this past week isn't going to matter now because this major cold front will certainly send us in some new directions. This cold snap is likely to trigger a movement of bait and fish from the shallow shoreline water out to the first sharp drop off areas. Water is an amazing insulator so I don't expect many of the weeds to die off this time around and we should be looking at some new fish arriving on the deeper weed edges this week. Ideally, surface temperatures will hit the high 50 to low 60 degree range and then stay there for a while. Walleye fishing for me took a turn this week as we saw the first evidence of a switch from fish that preferred the live bait rigs, night crawlers and leeches over to a preference for jig and minnow combinations. Beginning with the rainy, cold weather we had last Friday, Walleyes started moving in heavier weed cover and abandoning some of the main lake flats and mid depth bars that we had been fishing. Whenever they shifted toward the weed cover, the jig and minnow presentation picked up for us. I'm expecting to see some new patterns emerging during the next day or two so I'm going to cut this report short and expand on it over the next couple of days. One new development from Tuesday (9-11) that I should note is that the Bluegills started moving out from weed cover into the open water. Areas where you've been finding fish may now be empty but if you start looking in 15 to 20 feet of water out away from the shallow weeds, you'll start marking some schools of fish. They may even be mixed with Crappie at this point. Because of the wind, we had to use heavier jigs than we have in the past, but even with a 1/8 ounce jig and cut piece of night crawler we managed to catch a couple of dozen fish. I plan on trying again today, so check back for an update on Thursday. Labor Day weekend has come and gone marking the end of our summer fishing season. It's unusual to have nice weather for the entire Labor Day holiday, but that's what we had this year. Sunny skies and warm temperatures had the fisherman out in force especially on Cutfoot Sioux and Lake Winnie where I spent the majority of my time this weekend and most of the past week. Late summer fishing patterns persisted and water temperatures were slowly rising all week long. We started the week with 67 to 68 degree surface temperatures and ended Sunday with 71 to 72 surface water. Mixed bag fishing has been awesome with Walleyes, Bluegills and Crappies all available during the same fishing day. In fact, I think this has been one of the better late summer periods (on Lake Winnie and Cutfoot) we've had in several years. For Walleye, I've been hearing a lot of folks talking about fishing with jig and minnows and to a lesser extent crankbaits. But for me, night crawlers have been the clear winner for producing the best Walleye fishing all week long. Drifting or back-trolling the weedlines in 8 feet of water have produced most of the fish, but we have found a few nice schools located on shoreline related bars and points in 12 to 18 feet as well. Most days we've had our best action during the mornings and so we fish walleyes until lunch time and then shift to panfish for the afternoon. On the windy days though, Walleye action continues all day long. The windy days have also been best for folks trolling the crankbaits and the side benefit for them has been a nice Northern Pike bite mixed in with the Walleyes. The jury is out about which crankbaits are best this summer. Salmo's #4 and #5 hornets, #5 Shad Raps, #7 Rattlin' Raps and the 1 ounce size Rattlin' Spot are all producing their share of fish on the shallow weedlines. Fish are more closely related to the bottom this season, so it's important to keep experimenting with lures, speed and distance behind the boat until you hit the magic combination. Remember, it may change every day, so don't get locked into a groove. If what you did yesterday isn't working, coach yourself into a new pattern and you will find some active fish eventually. For Pike, we've had some action casting Musky size spinnerbaits, jerk baits and trolling larger Sucker minnows or Creek Chubs. With all of the sunny weather, fishing for pike has been hit and miss. 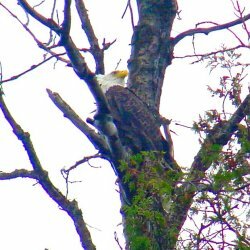 They've been active during early morning and on cloudy days. On cloudy days they remain active during most of the early part of the day, but even then the action drops off during mid day. If you really want to zero in on larger pike, get out there early and fish the first few hours of daylight and then switch to something else during mid day. Crappies continue to be active and we've had excellent results searching for schools of fish in open water near the shoreline. You won't need to go real deep yet, but they are starting to shift away slightly from the tight inside turns. More fish are showing up in open, meandering water in depths of 16 to 24 feet. The pattern is simple, move along slowly watching your graph for a school of fish. Stop when you find them and vertical jig with an 1/8 ounce or 1/16 ounce jig tipped with a small minnow or piece of cut night crawler. I think it's important to try that cut night crawler as I have been catching an above average number of fish on that piece of worm and it gives the Bluegills something to think about too. Many times the schools are mixed with Crappies suspended 5 to 8 feet above the bottom and Sunfish hugging closer to the bottom. Sunfish are still mainly related to the weedlines, but this week I've noticed more pressure on them and they are starting to move away from some of the popular spots. I see more fish showing up in the deeper water (16 to 20 feet) outside of the weedlines and I'm expecting to see that trend continue. From here on through to the freeze up we're looking at emerging fall fishing patterns and a return to cool water. As we start to see colder temperatures at night the weedline fishing will continue to improve, so don't put away your fishing gear just yet, there's a lot more good fishing still to come.